In some alternate universe, Star Trek reruns are airing with Jack Lord and Martin Landau in the roles of Kirk and Spock. Hey, that sounds like a Star Trek plot in itself. In the first pilot episode, "The Cage," Jeffrey Hunter played the captain, Christopher Pike. Unfortunately, networks passed on the pilot. Thanks to the good graces and television smarts of Lucille Ball, Star Trek was given the rare second chance. A new pilot would be made. However, Hunter would not return for the second pilot. The official reason given at the time said that Hunter jumped the series to do movies instead. The truth was perhaps a little more scandalous. In his memoir Star Trek Memories (1993), William Shatner revealed that the producers canned Hunter after his wife repeatedly stormed onto the set insisting on more flattering camera angles for her hubby. But the thing is, Shatner was not even the guy Gene Roddenberry wanted to replace Hunter. NBC requested a second pilot episode with significant changes to the characters, cast and tone of the show. It was back to the drawing board. Three potential scripts were written with greater attention to action — "Where No Man Has Gone Before," "The Omega Glory" and "Mudd's Women." Roddenberry had a new lead role — Captain James Kirk. The names floated around by casting consultants, the network and creatives included Nick Adams, Lloyd Bridges, Peter Graves, Robert Stack, George Segal, William Shatner and Jack Lord. Roddenberry knew who he wanted. 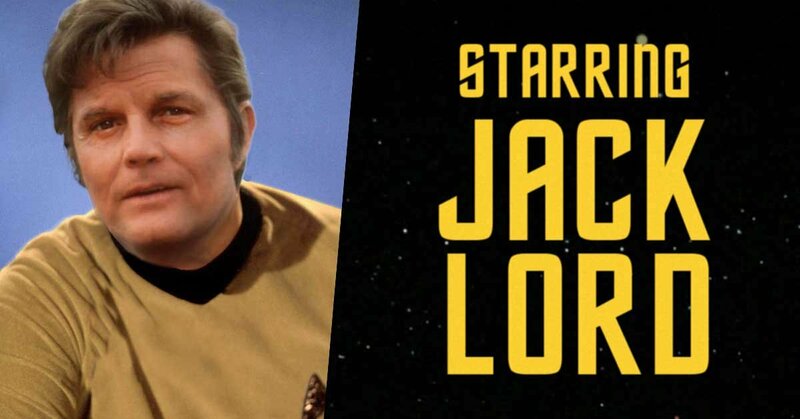 The Star Trek creator's first choice was Jack Lord. Lord had a fascinating personal history of his own serving on ships. He was born John Joseph Patrick Ryan. In World War II, Ryan first served in the U.S. Army Corps of Engineers. He built bridges in what is now Iraq. He had done some of his schooling at the United States Merchant Marine Academy, and Ryan returned to the Merchant Marines in 1944. After leaving an African port, his ship was torpedoed by a German submarine. Ryan was stranded on a lifeboat at sea for 16 hours. He promised himself if he survived he would change his life. After his rescue, he changed his name to Jack Lord. By the time of casting Star Trek in the mid-1960s, Lord had a lengthy resume, including starring in the lead role in the ABC Western series Stoney Burke. Roddenberry offered Lord the Kirk gig. Perhaps due to his experience as a lead, Lord had rather high demands for Star Trek. Lord wanted to produce as well as star. And he wanted 50% of the profits from the series. Even for sci-fi, that was astronomical. But give the actor credit for seeing the potential of the Star Trek franchise. With Lord out of the picture, Star Trek turned to Shatner, who was coming off his recently canceled legal drama, For the People. Lord would eventually land the starring role of Steve McGarrett on Hawaii Five-O. From 1968–80, he tracked down crooks in paradise, spitting his catchphrase, "Book 'em, Danno." He managed to get a deal for 33% of the profits, too.